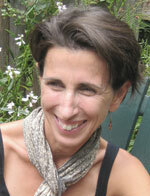 Kim Triedman began writing poetry after working in fiction for several years. In the past year, she’s been named finalist for the 2007 Philbrick Poetry Award, finalist for the 2008 James Jones First Novel Fellowship, semi-finalist for the 2008 Black River Chapbook Competition and winner of the 2008 Main Street Rag Chapbook Competition. Her poems have been published widely in literary journals and anthologies here and abroad. She is a graduate of Brown University and lives in the Boston area with her husband and three daughters. This is her first collection. In this beautiful and accomplished first collection, Kim Triedman writes movingly of being a child, a mother, a lover, a daughter, but most of all of being a person with a body in a world of intense experiences, experienced in the body and in the intensity of language itself. These are stunning and often breathtaking poems. I can’t wait to read more! Nature is a shaping presence in Kim Triedman’s poems of self and family—poems with the tensile strength and delicacy of a spider web. The season at the heart of them is winter: chill-choked;/ knife-blue sky sharpening/ its edge against/ the iron of the earth. Even indoors, the air is bright, etched, elemental. These revelatory poems discover beauty in the roughest terrain of love, of loss, of change—guided by the speaker’s quiet, yet insistent voice of the color of/ flame. the iron of the earth. seagulls hang, frozen in sky. your mind a bluish thing, twilit. of time, plumbing its bluish depths. Be the first to review “Bathe in it or Sleep” Click here to cancel reply.